1. Respect their personal space. They maybe your favourite person in the world and they might love you too. But if they don’t make the first move to hug you – don’t hug them. If you hug them when they are not feeling up to it, you’ll just find yourself wondering if you did something wrong. Maybe you did. But chances are they just need to find their inner calm before they are ready fully accept and embrace you. This could be the 20th time they are meeting you or the very first one. If they are in a bad mood, bugging them about what is bothering them is not going to help you. They’ll shut off even more and might find your incessant questioning so irksome, that they could decide to cut you off from their lives completely. If you care about the introvert in your life, a word of advice: when they tell you to back off, respect it. 3. Hibernation is a thing. Yes, there are days when you won’t hear from them. It would be like they never existed. They are not sad or angry with the world. They just need time to recharge their batteries. So they go into hibernation. Real life prevents me from doing that. But when I was college, my friends made me promise I would tell them before I went off into hibernation. I retrospect that helped all of us. 4. They find certain people overwhelming. 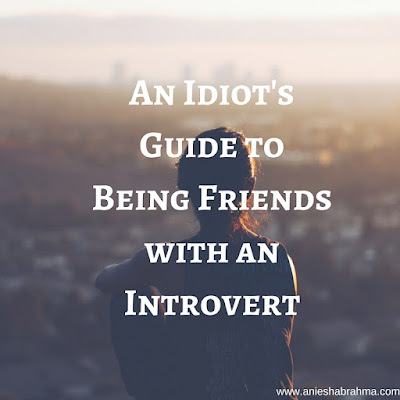 Introverts cannot handle being around all kinds of people, all the time. 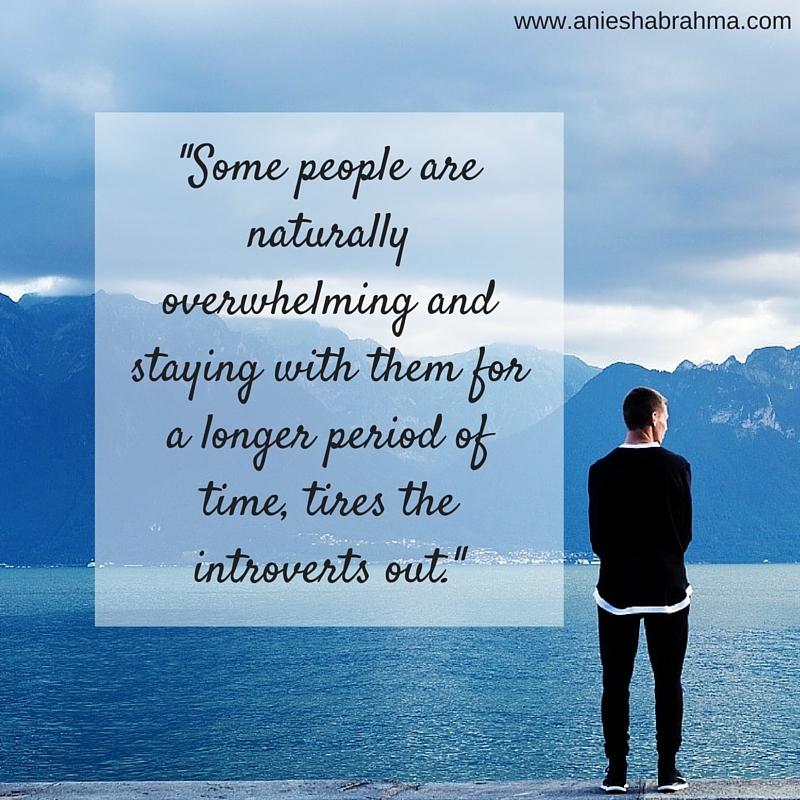 Some people are naturally overwhelming and staying with them for a longer period of time, tires the introverts out. They are, therefore, very choosy about who they let into their life. Even then, some people around them might be more naturally draining than others. So don’t be surprised if they don’t sound too enthusiastic about your plans to pull all-nighters or movie marathons! 5. They need to gather strength to go party. While most people get naturally excited about going to parties and socializing, the introvert’s biggest fear is being let loose into a room full of strangers. 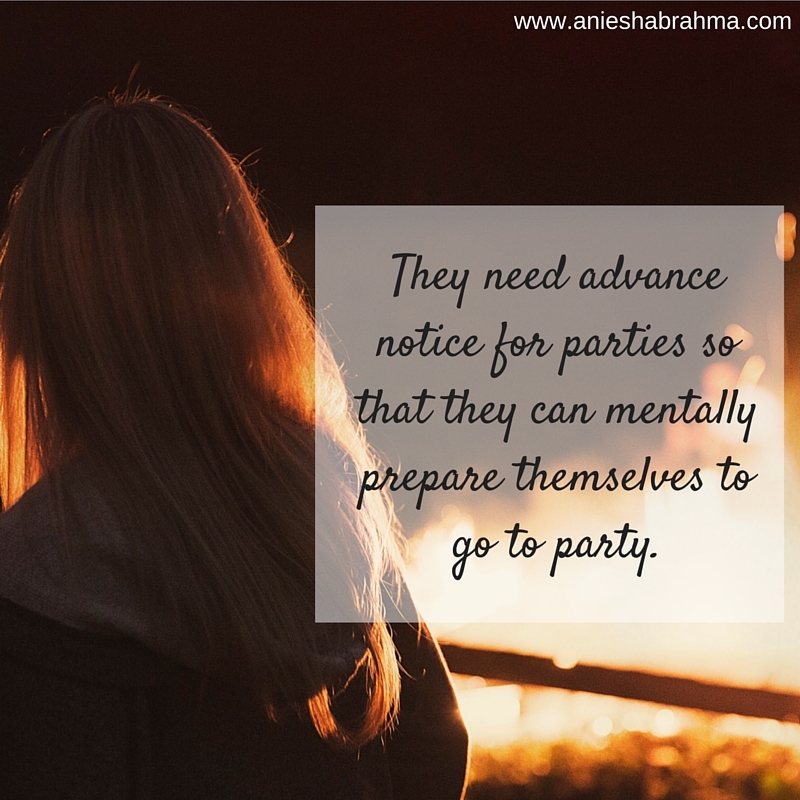 They need advance notice for parties so that they can mentally prepare themselves to go to party. 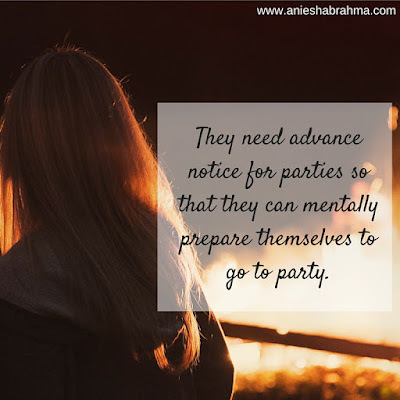 An introvert will almost never accept a last minute invitation to a party. 6. They are very particular about who they let into their life. An introvert is naturally choosy about who gets to be a part of their life. However, they can easily fool you into believing you know everything about them...yet what you might know about the introvert is just the tip of the iceberg. 7. No doesn't mean try again tomorrow. You might be very excited about doing something you share that with your introvert friend. They smile and gently refuse to go with you. 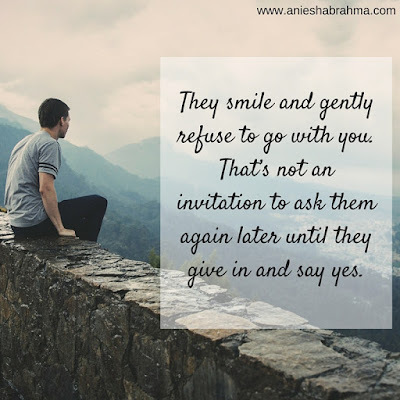 That’s not an invitation to ask them again later until they give in and say yes. Chances are they’ll just get irritated and subtly drift away from you. A word of advice: don’t try again tomorrow. 8. They like a few close people as opposed to a loud party. On the other hand if you invite an introvert to spend quality time with a few good souls, they can turn out to be the life of the party. They are patient listeners and with them, you can trust that your secrets are forever safe. 9. There are extroverted introverts too. And these are rare but they do exist. Their interest in the party might come as quickly as they go. They love making friends, but at the same time might feel overwhelmed if they are forced to spend too much time with them. Life is more difficult for them as they always struggle to find balance. 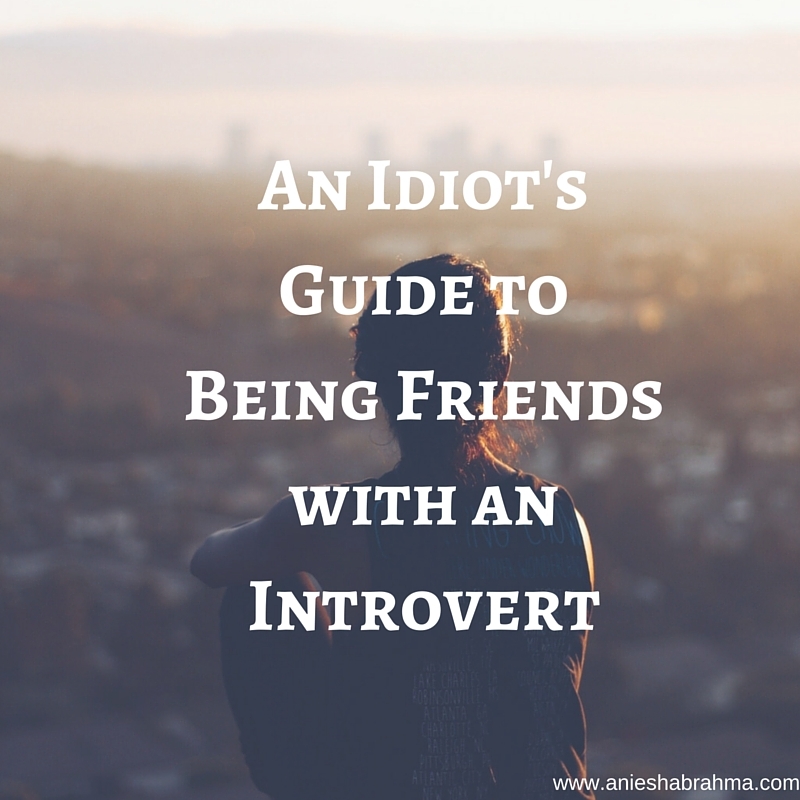 You might have at least one extroverted introvert as your friend: the one that constantly takes you for a ride. Bear with them. They are as confused by their behaviour as you are! 10. They love cancelled plans and staying in secretly. Friday nights for introverts might mean curling up with a good book, watching TV shows or spending quality time with their pets! 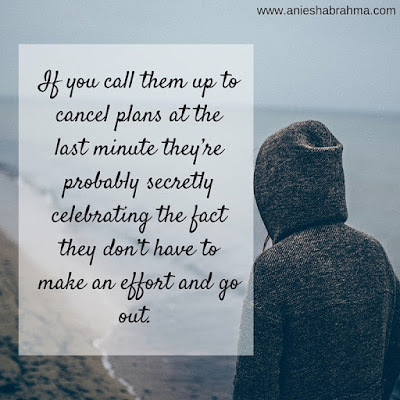 If you call them up to cancel plans at the last minute they’re probably secretly celebrating the fact they don’t have to make an effort and go out. Cancelled plans are what introverts sometimes draw their energy from. 11. But they are also naturally calm people to be around. If you feel anxious or agitate, some introverts might be the people for you to be around. They have naturally calm natures and their presence would help your flustered soul. So consider yourself very lucky if your introvert friend is around to help you feel better when you’re having a particularly bad day! Perfect, perfect, perfect! Since I am no 9, all the more perfect! We are all a little introverted and you know what, its's okay. Never let anyone tell you any differently. 1.a true introvert is a thinker too,they don't like reading books,they spend time thinking and discovering theories on their own when they are alone. 2.they don't like living according to others ideology or they never quote others cuz they are self-realized. so whenever they write something,they stand out in million. 3.a true introvert is a whole-hearted person and instinctive,they can never allow or like superficial people and superficial emotions into their life. 4.a true introvert is rebel/revolutionary/extremist/always morally right cuz they don't like anything immoral and won't stay silent when something is going wrong. they never beat around the bush,they are always straight forward. 5.a true introvert has very few or no friends cuz they never allow superficial people and superficial emotions are irritant to them. 6.when a true introvert breaks his inhibitions,he is most craziest and unbelievably charming.though they have natural charm. 7.in the end,a true introvert is simple and naturally human or human in purest form. And I beg to differ. Even true introverts, have real friends. I appreciate your effort though. By the way, my favourite theory growing up, was that Harry Potter was real and he would come rescue me from school, where I was thoroughly miserable. introvert: A term introduced by the psychologist Carl Jung to describe a person whose motives and actions are directed inward. Introverts tend to be preoccupied with their own thoughts and feelings and minimize their contact with other people. according to above definition ,it just defines primary aspect of introvert.true introvert means someone who has grown into person beyond definition and whether the person has done justice for his aloof personality and for being preoccupied with their thoughts. true means doing justice for that term and whatever i have written is outcome of such personality. true introverts may or may not have friends cuz they can mix up with people only if they are as transparent as glass with great integrity.they can make friends if they come across such people.you don't find such people in many. you have grown up with harry potter stories,so you think that way :-). since am a small town guy,we are not westernised.when i was kid,my dad used to translate volumes of mahabharat and ramayana from sanskrit to telugu to tell us bedtime stories.so i have grown up on strong moral ground and realism.when i was kid,i used to go in his government vehicle to know how the real society is like.so a person becomes introvert by relating his personality with society from childhood.so none is born introvert. 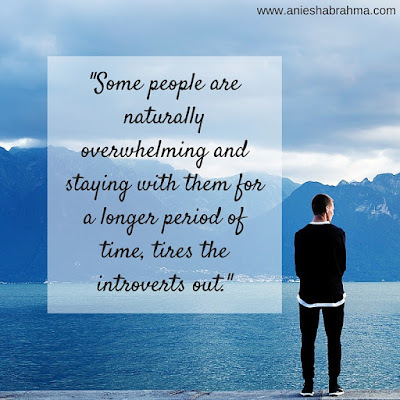 at the end of the day,what's end result for being preoccupied with your own thoughts and feelings and to minimize your contact with other people.personality from end result defines true introvert. introverts and extroverts don't exist if people are of flawless mind and if we are living in an ideal society. someone just discovered the personality as introvert cuz there was some section of people whose mind din't go corrupt in this survival of fittest world.so introvert has become a fancy word and its defined by some limited characteristics which is also flawed. so think of words beyond english and dictionary definition. To each his own, dude. P.S. 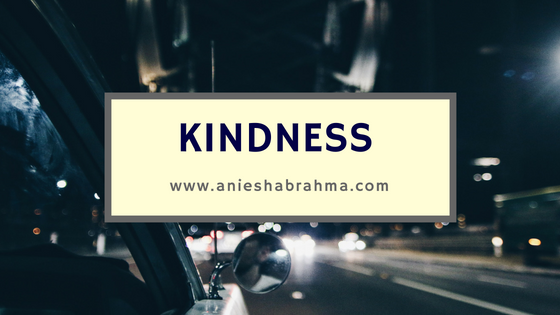 I wrote this blog post in the hopes to help people such as myself an assurance that they are not alone and there's no way to snap out of being the way you are. :) And it's okay. Make peace with yourself. And life will follow suit. hmm peace,let harry potter's magic wand bring peace to fellow bloggers :-). 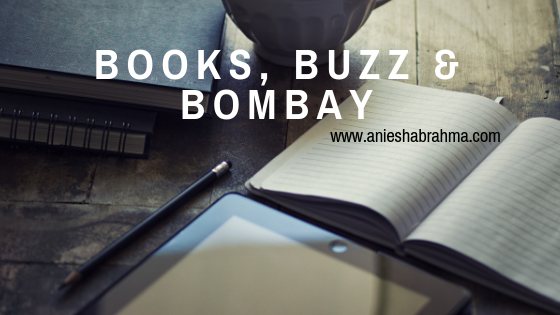 you may check below blog link. She has a point. And so do I. And so do you.